Usually I’ll write some recaps of the games as the season progresses, but after the first two games of the 2011-12 season, there’s really not much positive to say for the Lakers. Hence I haven’t felt like writing all that much. Of course box scores and stats have been updated as they always will be, although that has been a chore too after losses. There’s really not much to say so far. The Lakers blew Christmas Day’s game against Bulls with some inexplicable decision-making down the stretch, as well as four costly missed free throws. They couldn’t have helped the Bulls more unless they put the ball in the basket for them. Monday’s game in Sacramento wasn’t much better. The Lakers never found any rhythm, and when they finally got to within two in the fourth quarter at 89-87, they allowed Marcus Thornton a wide-open three-pointer and that was pretty much that. Two really ugly losses for different reasons. Hopefully tonight against Utah will finally allow the Lakers to right the ship, but right now it’s difficult to know what team will show up. Hoping this is just an early season bump in the road with the short training camp, new players, and new coaching staff. 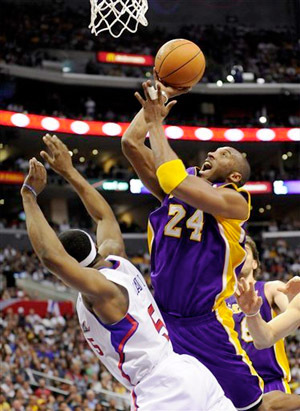 Kobe Bryant goes up for two against Clippers. The Lakers frustrated Blake Griffin, frustrated the Clippers, then watched it all come apart in the fourth quarter, and saw their 7-game winning streak go with it in a 99-92 loss to the Clippers at Staples Center on Sunday. Kobe Bryant had 27 points, nine rebounds, and five assists, and took the game over in the third quarter as the Lakers built a 12-point lead at 67-55. But after that run, it was all downhill for the champs, as the Clippers started making shots, and Griffin got physical inside. In a tight game, the Lakers led 45-44 at halftime, with Griffin scoring just two points, as Pau Gasol and Lamar Odom made life hard on the Clippers’ star rookie. After the Lakers led by double-digits late in the third quarter, the Clippers came alive led by the scoring of Eric Gordon and Griffin. After a three-pointer by Ron Artest put the Lakers up 82-78 in the middle of the fourth quarter, the Clippers used a decisive 16-3 run to put the game away. Then tempers got a little testy. Griffin pushed Lamar Odom in the back going for a rebound with five seconds left, to which Odom was not too happy in a game that was clearly over. The two got tangled up and went into a war of words with some pushing. Artest and Baron Davis ran in and tried to be peacemakers in the altercation. No punches were thrown, but all four players were ejected, with Artest’s ejection seeming quite ridiculous. Andrew Bynum had 18 points and 13 rebonds for the Lakers, and Pau Gasol added 13 points and eight boards, but had a very tough time with the physical Griffin in the second half, and eventually fouled out of a forgettable ending for the Lakers. Griffin, after a terrible first half, finished with 18 points and 15 rebounds, but shot just 7-20 from the floor. His string of 14-straight games with over 20 points was also snapped. Gordon had a game-high 30 points, hitting 13-20 from the field and 4-7 from beyond the arc. Davis was the only other Clipper in double-figures with 14 points. The Lakers shot miserably from the field, at 41.3% (31-75), and an even worse 3-20 (15.0%) from the three-point line. They did get to the foul line 33 times, hitting 27, which helped offset the poor shooting from the floor. The also lost the rebound battle 50-45. The Clippers didn’t shoot much better at 43.7% (38-87) from the field, but they hit 9-21 (42.9%) from long range and had 15 offensive rebounds. The loss dropped the Lakers to 30-12 on the season, and 14-7 on the road. The Lakers’ next game is Monday against Kevin Durant, Russell Westbrook and the Oklahoma City Thunder at Staples Center. The Thunder come in with the third-best record in the Western Conference and have won four straight. It will be the team’s first meeting since the Lakers beat the Oklahoma City 4-2 in a memorable first round match-up in last year’s playoffs.